This year’s National Letter of Intent signees of Pahrump Valley High School will not be starting their college careers alone. Two of them are going to the same school to play football, and the third again will be playing baseball with his brother. Tom Rysinski/Pahrump Valley Times From left, seniors Willie Lucas, Zach Trieb and Nico Velazquez before the signing day ceremony Wednesday at Pahrump Valley High School. Tom Rysinski/Pahrump Valley Times Pahrump Valley High School senior Willie Lucas signs his letter of intent Wednesday to play baseball at Big Bend Community College in Moses Lake, Washington. 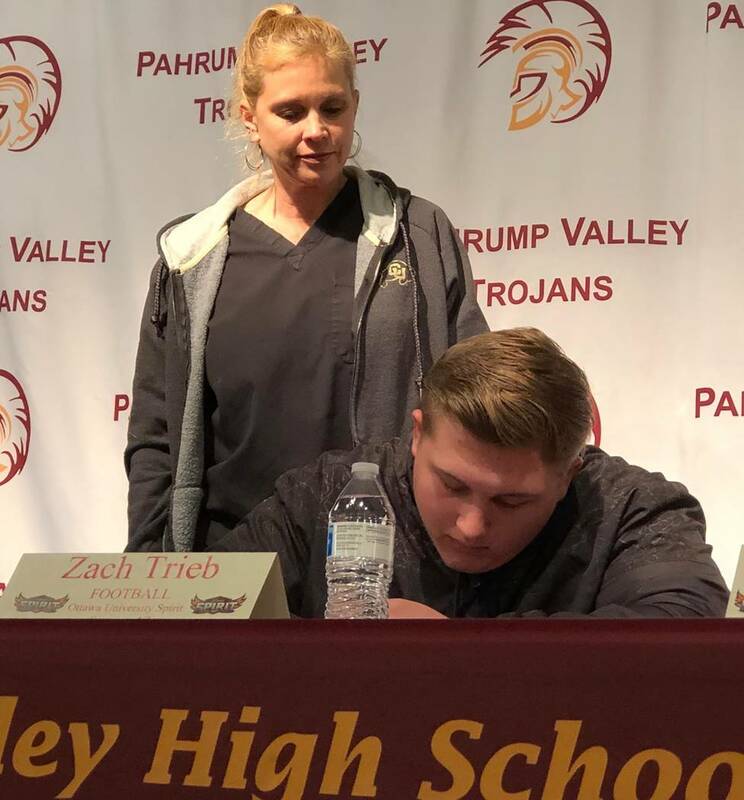 Tom Rysinski/Pahrump Valley Times While his mom looks on, Zach Trieb signs his letter of intent to continue his football career at Ottawa University in Surprise, Arizona, on Wednesday at Pahrump Valley High School. Tom Rysinski/Pahrump Valley Times Nico Velazquez after signing his letter of intent to play football at Ottawa University's Arizona campus on Wednesday morning at Pahrump Valley High School. Willie Lucas, Zach Trieb and Nico Velazquez made it official Wednesday, joining athletes from all over the country in making their college choices official on national signing day for several sports. The latter two are heading to a newcomer on the college sports scene. Ottawa University in Surprise, Arizona, a member of the National Association of Intercollegiate Athletics, is a new campus of the more well-known Ottawa University in Kansas. That school should ring a bell locally, as former Pahrump Valley wrestler Antonio Sandoval is a redshirt sophomore there. The Arizona campus, whose teams are called the Spirit, was founded in 2017 and already fields 21 varsity sports, even though some still play at a local high school. But the football team has a home field, and Spirit Field, with permanent seating for 1,200, soon will have an adjacent three-story building featuring a locker room, training room, weight room and athletic offices, with a press box and VIP space on the top floor. But it’s the ground floor Trieb and Velazquez are getting in on, and they are excited about the prospect. 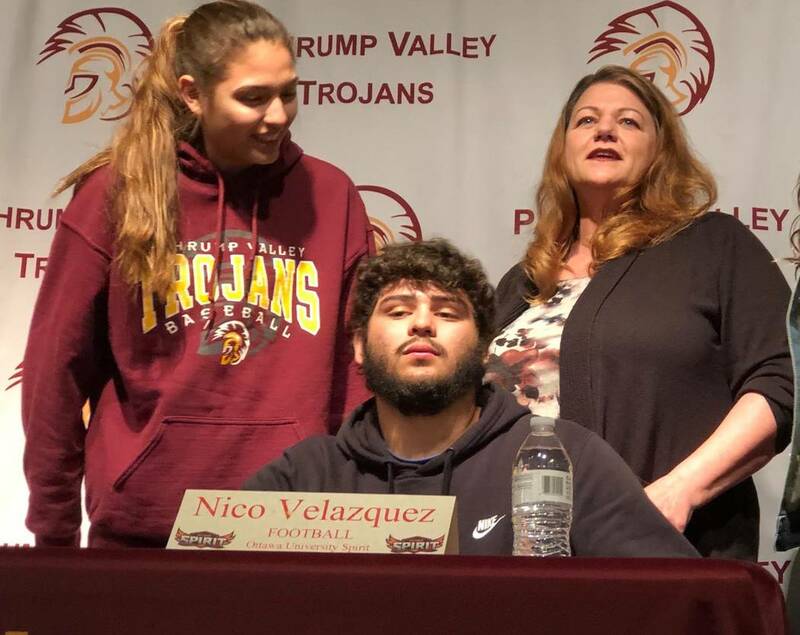 Pahrump Valley football coach Joe Clayton was not surprised Trieb and Velazquez received an opportunity to play football in college. If Clayton gets that chance, the game he will see from the stands bears little resemblance to the game he coaches from the sidelines. But the Spirit do know how to run the ball, and already they have learned how to win. They went 7-4 in their inaugural season, which ended with a 38-35 loss to Olivet Nazarene in the National Christian College Athletic Association’s Victory Bowl. And while they averaged 367 yards per game through the air, the Spirit accumulated a solid 166 yards per game on the ground. 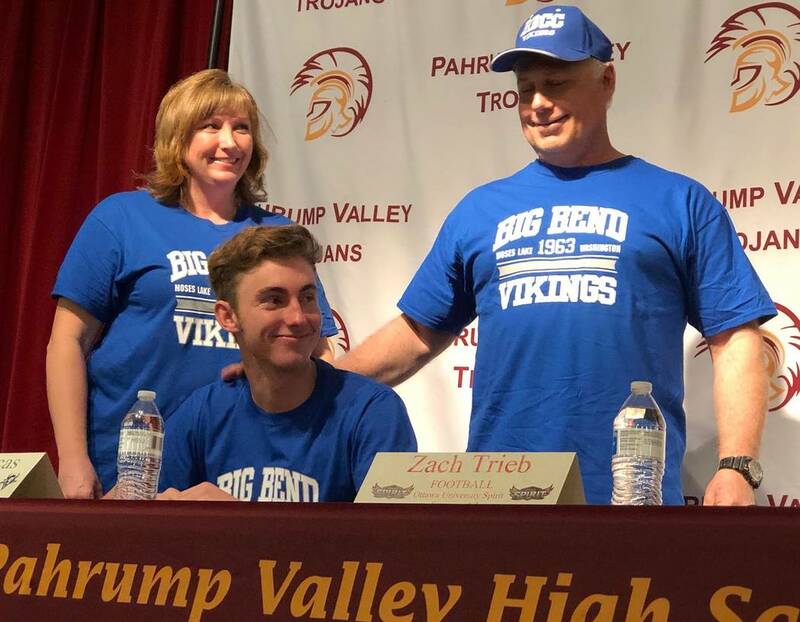 “The losses they had were by a field goal or one touchdown,” said Trieb, who said he also had a scholarship offer from Presentation College in South Dakota and considered Winona State in Minnesota. While OUAZ, as the school is known, is a member of the Golden State Conference, the conference does not sponsor football, so the Spirit play football in the Sooner Athletic Conference against opponents from Oklahoma and Texas as well as Arizona. They were 5-3 against conference foes in their inaugural season. Both Trieb and Velazquez plan to study biology in a pre-med program. Meanwhile, Lucas will continue his baseball career at Big Bend Community College, a school he never heard of until his brother, Garrett, chose to play there. Garrett Lucas signed his letter of intent at a similar ceremony last year. Lucas has a clear vision of his future and how Big Bend fits into it. And Lucas is not placing limits on that bigger college. “Possibly UNR or UNLV if I don’t get another offer, but hopefully I’ll get another offer,” he said.